Heat gas or charcoal grill. In small bowl, combine marmalade, lemon juice and basil; mix well. Spray skin side of salmon with nonstick cooking spray. Turn salmon over; sprinkle with garlic-pepper blend and salt. When grill is heated, place salmon, skin side down, on gas grill over medium-low heat or on charcoal grill 4 to 6 inches from medium-low coals. Cook 12 to 17 minutes or until fish flakes easily with fork, brushing with marmalade mixture during last 8 to 10 minutes of cooking time. Fish fillets often have one end that is thicker than the other. To evenly cook fillets, simply arrange them so the thin ends are at the outside of the grill where the heat is less intense. Leave the skin on to hold the fish together. It is easy to remove the meat from the skin after cooking. 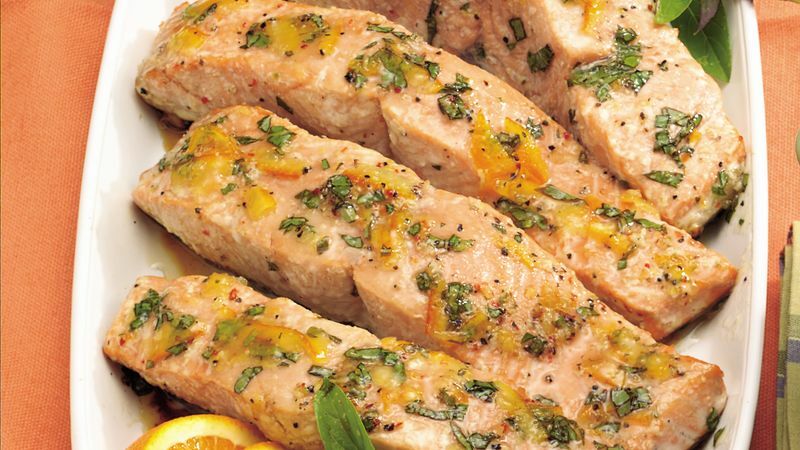 To broil salmon, place skin side down on broiler pan; broil 4 to 6 inches from heat using times above as a guide, brushing with marmalade mixture during last 8 to 10 minutes of cooking time.